Hi St. John’s Salsa Dancers past present and future! It’s been a pretty exciting few years since I (Judy) started getting involved in our “little” salsa scene back in 2006. Just thought I’d highlight a few moments along the way that helped grow our Salsa community to its thriving present-day scene. I realize many of you reading this are new to our scene and won’t know these places, but I’ll add some pix to give a little context. For those of you who DO remember and are still members, thanks for sticking around…there’s lots more still to come! Where I started: The Bella Vista! At that time there was VERY limited access to salsa. You could pay for sets of lessons at a formal dance studio, you could find a lovable Mexican named Esau at the old Mexi’s, or you could drop into the then brand new salsa lessons on Tuesdays at the Bella Vista. These were hosted by Deneen Connolly as part of her effort to share her love of Salsa dance with Newfoundlanders. I spent a few years going to Tuesday night beginners’ lessons and socials, and occasional special weekend Latin Fiestas. This venue certainly helped set the scene for a salsa explosion. No couches allowed on the dance floor! Weekend salsa warriors: Between 2007 and 2008, there must have been more house salsa parties in St. John’s than ever before! Tuesdays were fine for beginners, but weekends were needed for those infected with the salsa bug…and there were dozens of us craving weekend salsa fixes. Couches to the bedrooms, coffee tables to the hallways, make room for another salsa dance party! Facebook group: Did I mention in 2008 I started a little facebook group so people would know where to find the next salsa party?! It was originally called something like “Salsa in St. John’s…Location TBA” but then got shortened to Salsa in St John’s. It was a public group and to our surprise a whole lotta people, especially international people living in St. John’s, started to join! We outgrew our house parties pretty quickly and needed a real weekend venue. That’s where things got REALLY exciting! A couple of group members, from Scotland and from Africa, found a little lounge in The Franklin Hotel that was willing to host us every Saturday evening for a few hours. We took turns playing the music, with members sharing their favorite tunes. And Salsa in St. John’s EXPLODED! We were packed Fiesta-style every weekend, sending oodles of people to lessons…to the Bella Vista’s expanded lessons and to new lessons with MUN BLDC. 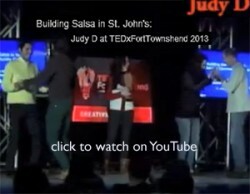 People just couldn’t believe we had Salsa in St. John’s! We stayed at The Franklin for almost a year, and then we had to move on…dancers just don’t drink much and the lounge picked up lots of new regular non-dance customers from our busy evenings. 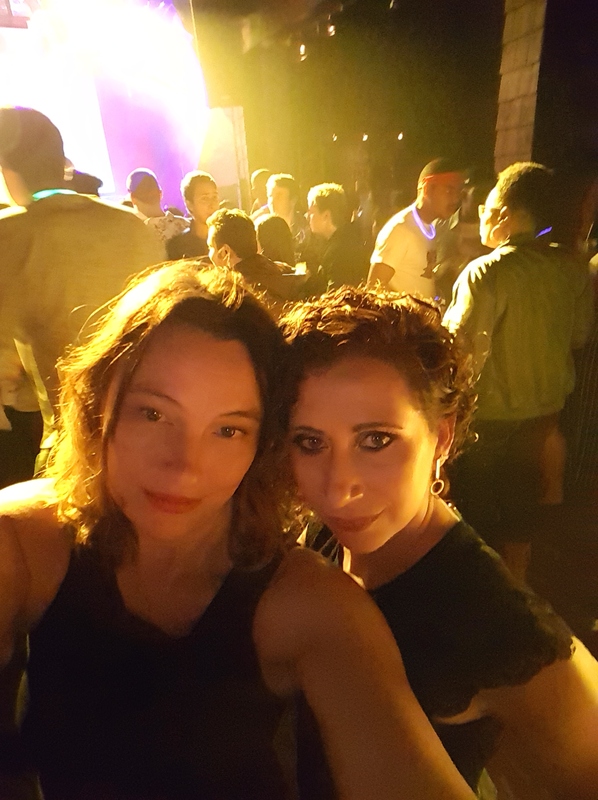 We’ve been hopping from venue to venue for our weekend salsa socials and parties pretty much yearly ever since, from The Lower Path to Mexi’s to The AnneXe to Turkey Joe’s. And our members have hosted special Fiesta’s, demos, fundraisers and parties at these and many other places: The Bella Vista, The Martini Bar, The Rocket, The Landing, The Ship, the old Majestic, Eastern Edge Gallery, The Mixx, Bally Haly, The LSPU Hall’s Cox&Palmer 2nd Space, Quidi Vidi Brewery, outdoors at Quidi Vidi Bandstand & The St.John’s Farmers Market, the RockHouse, various community centers…so many people have hosted so many Salsa events here in li’l ol’ St. John’s NL! Along the way we’ve had super instructors help us grow our community: Deneen, Esau & Tamoc, Alex & Jim at MUN BLDC, Corie & Stephanie of Salsa Floreo, Jim at Wild Lily, Del & Stacy of Bailamos St. John’s, and drop-in volunteer instructors and instructors aids like Helen, Jim, Tamara, Sandra, Teeba, Dais…I’m sure there’s many more I’m forgetting or haven’t met (yet!) who are spreading the Salsa fever! I can’t forget to mention the DJ’s and musicians who hopped on board to help us out. Deneen and the members of Salsa Roca carved out a Latin niche for themselves for a few years. DJ Gustavo wows the crowd whenever he has time to host a party. DJ Marcelo is working the salsa scene at Annexe Lounge. DJ Chamba rocks the house wherever he spins his Latin tunes! And we have Onelvis Hierrito Fernandez, our very own Cuban musician living in St. John’s scheduling live concerts regularly. LESSONS: Currently there’s beginner’s lessons with Bailamos St. John’s instructor Stacy Fowler. Check back on our site regularly for even more salsa lessons, workshops, etc. PARTIES: There’s weekend salsa dance parties at least once a month at various venues ( next one is this Sat Feb 1st 2014 at brand new venue RockHouse Pub). Keep checking our salsainstjohns.com site for news of other upcoming events! LIVE MUSIC: Cuban-born musician Onelvis Hierrito Fernandez recently moved to St. John’s and is scheduling live concerts regularly (next one’s at The Ship on Feb 6th 2014!). FUNDRAISERS: Salsa dances are the latest craze for fundraisers! Over the years our salsa group has fund-raised for various non-profits including CBCF, RIAC and THRIVE-CYN, as well as for individuals during times of need. Contact me (judy.salsa”AT”gmail.com) to discuss your salsa fundraiser needs. So if you’re a Salsa dancer living in St. John’s, or heading our way, don’t forget to look up Salsa in St. John’s to find out what’s on the go in our little BIG salsa scene.